Poet Claire Crowther in conversation with Chloe Garner in The Panelled Room of the Master’s House in Ledbury. Claire Crowther is a widely published poet whose first collection, Stretch of Closures, was shortlisted for the Aldeburgh prize. 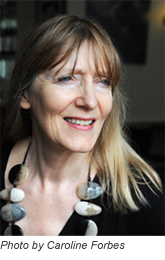 Her poems and reviews have appeared in PN Review, Poetry Wales, Poetry Review, TLS, London Review of Books, Magma and in anthologies such as Best British Poetry. She lectures and runs workshops, for example on the Poetry School MA and Oxford University BA in Creative Writing. She has recently finished a year long residency at the Royal Mint, which resulted in the pamphlet Bare George. Her latest collections are On Narrowness (Shearsman Books)and Silents (Hercules Editions). A selection of her poems can be heard on the Poetry Archive.